Brewery tours and experiences for groups, parties, stag and hen dos - Wanderlust Camper Co.
Great experiences, tours and events combined with unique campervan stay at a craft brewery nestled in the countryside. Ideal for weekend breaks, stag and hen-do's, parties, weddings and special occasions. Hillside Brewery are very proud of being a small brewery. Offering an ever-evolving range of craft beers, visitors can be sure of fabulous beer that caters for every taste. However, there’s much more than just the award-winning beer on offer at Hillside Brewery. ​There is a great range of experiences and events for guests to enjoy too. and get in touch with either us or Hillside Brewery to finalise. Brewery tours, experiences and events offered at an idyllic location at Hillside Brewery - the home of award winning beers. combine with campervan stay at the Brewery's farm premises. ​across the rolling hills of the Forest of Dean. The brewery tours takes in a walk around the working brewery by one of the brewing team and a tasting session! Choose from a great range of experiences, from 1- hour sessions to all day experiences. Ideal for stag-dos, hen-dos and special occasion parties. Minimum numbers of 8 for some activities. Choose set packages from the activities on offer or enquire about a bespoke package with Hillside Brewery. Hillside Brewery are authorised agents to book your campervans for your stay - therefore you may enquire with us about campervan availability however to enquire and book experiences, please contact Hillside Brewery direct. Spend the day with Will, the Head Brewer and learn what it takes to create one of Hillside Brewery’s classic ales. Using the recipe from one of Hillside Brewery’s beers you will use a micro-brewery to create your very own cask or bottle of beer. The brew your own option, offers you a unique and informative hands-on brewing experience, which is relevant to those who are keen home brewers and people who love beer. You'll take home with you lots of handy tips to help you develop your brewing and beer long after you leave. Hire our campervans for your stag or hen do for your stay at Hillside Brewery. you'll be sure of a magnificent stag or hen do that will delight the bride or groom. How about outdoor laser combat, followed by archery tag then a spot of lunch and then clay pigeon shooting, and closing with a Brewery Tour and a tasting session of the Hillside Brewery beers, ciders and lager? Or a more genteel day then with prosecco, Indian cooking school and even spa days are possible. ​Combinations for every tastes are catered for with a campervan that accommodates small groups, families with children and couples. With Hillside Brewery hosting your big day and our glamping campervans for use for the more adventurous bridge & groom, or wedding guests, you can be sure your wedding will be unique and fabulous. 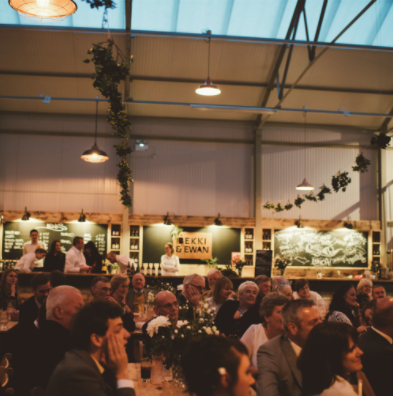 The renovated ‘old’ barn accommodates up to 200 guests for a sit-down wedding breakfast with plenty of space for your band and dancing shoes. The fantastic venue of Hillside Brewery should be top of your list! The 'old' barn as been renovated with every modern comfort to provide an unbelievable blank canvass for you to put your own mark on and offering underfloor heating, galley kitchen, programmable led lighting and a superb terrace. With amazing views overlooking the hills of Gloucestershire and Herefordshire from the terrace and from the campervan field, you can be sure of a fabulous view all the way through the day and evening and even when you wake up the next morning and step out of your cosy, glamping style campervan. 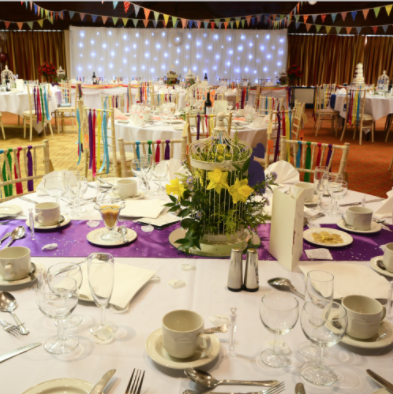 It will be a venue that will wow your guests – whatever their age and whatever their tastes.